Food, like fashion, sometimes falls victim to style trends. But in the case of Dinty Moore® stew, the explanation for lagging sales was much more fundamental, not to mention easier to fix. That came as a relief to team members at Hormel Foods. When they set about the task of finding out why popularity of the 83-year-old brand was declining, they learned shoppers simply had stopped thinking about it. The research made sense to Sarah Johnson. The brand manager for Dinty Moore® stew and Mary Kitchen® hash grew up on the famous stew. Sarah often prepared it for dinner when her mother was traveling and her father was working nights. But it fell off her radar as the years went on, she admits. Though it was true fewer consumers were putting Dinty Moore® stew in their shopping carts, it was continuing to delight those who did. And with good reason. The beef variety – by far the largest seller in the line – traces its roots to the 1930s. Though the recipe has been tweaked during the years, it’s remained faithful to the one to which Jay Hormel gave his stamp of approval. 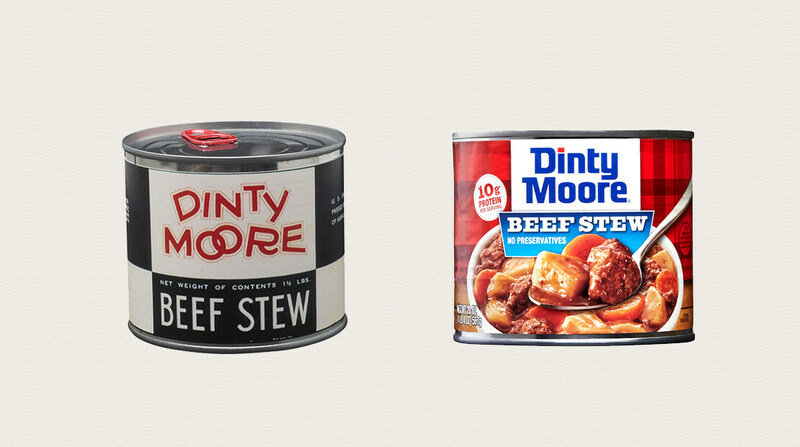 A can of DINTY MOORE® beef stew from the 1940s and today. Many long-time consumers like Kay Schmidt, a 40-year-fan of Dinty Moore® beef stew, seem to understand that. It has been the centerpiece of her family’s Christmas Eve dinner for decades. And like Hormel Foods, she knows better than to fix what isn’t broken. “What we’ve done really well from day one is a very good quality product that appealed to what people ate,” Sarah says. 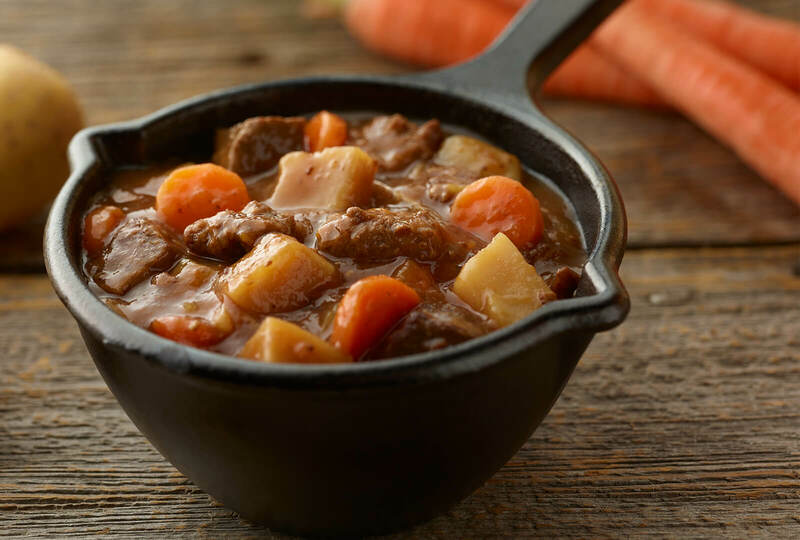 Over the years, different varieties have been developed, “But at the end of the day, we hang our hat on the success of our beef stew,” Sarah says. In fact, in more than 80 years, there’s been little departure from the tried-and-true recipe of beef, carrots and potatoes. Today’s line includes only two Dinty Moore® recipes: beef stew and chicken & dumpling, with the beef version reigning supreme. “As we’ve progressed, we haven’t done too much in the way of line extension and flavor varieties, but we have evolved in how people prepare their food,” Sarah says. In addition to Dinty Moore® meals in cans, the brand offers single-serve options and microwaveable varieties that conform to busy lifestyles. The products are in some club stores now and have an online presence for the growing number of consumers who prefer to browse websites instead of grocery-store aisles. “We’re trying to be where consumers need us to be,” Sarah says. Just as important, perhaps, Hormel Foods is targeting younger consumers as a way to build its base of support. Communication with a new generation has come in the form of education meant to point out the protein value, calorie count and gluten- and preservative-free properties of Dinty Moore® meals, items of interest to today’s consumers, especially those at the younger end of the spectrum. At the same time, there are memorable marketing programs like Stewski and Lumberjacks Eat Moore, lighthearted depictions of the blue-collar image that gave rise to the best-selling stew in the world. Ads run on networks and applications such as ESPN, eBay, Spotify and Pandora, havens of the millennial generation. Not only are the campaigns fueling sales, they’re getting props from ad pros and the industry. Lumberjacks Eat Moore took home a gold award and was a contender for the year’s best marketing effort at the 2018 North American Effie Awards Gala. The recognition came on the heels of online publication Food Dive lauding the resurgence of Dinty Moore® stew. Sarah explains the success of the campy commercials and advertisements. “It’s tongue-in-cheek nostalgia,” she says. For starters, they’re an homage to the product’s mascot (of the same name), a fictional lantern-jawed, muscle-bound, Paul Bunyanesque woodsman. Plus, they’re true to the roots of Dinty Moore® stew as a down-home, affordable meal for hardworking folks. The genius is you don’t have to be any of those things to kick back and crack open a “stewski,” as the lumberjack and his critter friend recommend. But after watching the commercials, an increasing number of people are doing just that. Some have even been motivated enough to pick up an ax. A group of the latter surfaced two summers ago when the Dinty Moore® brand ran a contest to give so-called lumbersexuals – fellas who dress the part without doing the job – some tree cred. By the end of the session with pro lumberjack Adrian Flygt, a team of four advanced to the big time: the STIHL® TIMBERSPORTS® Series U.S. Pro and Collegiate Championships in Chicago. For all intents and purposes, the promotion was a hit and “a great way to drum up excitement over reconnecting with our customers,” Sarah says. Putting the comeback of Dinty Moore® stew in perspective is Food Dive. “With more than 20,000 food and beverage products making their way to the marketplace each year, failure is inevitable. Data analytics company Nielsen estimated in a 2014 study that only 15% of consumer packaged goods launched in the U.S. are still around two years later. Even fewer have the longevity of a brand like Dinty Moore® stew,” it says. Hanging on is a notable accomplishment. Growing puts Dinty Moore® stew in truly rarified air. Sales have been increasing for several years, and there has been “incremental growth in four-week periods during the last 52 weeks,” Sarah says. The team at Hormel Foods is delighted with the results, but far from resting on its laurels. “As happy as I am, there is more we can do,” Sarah says. Leaning in, she talks about an upcoming program with camping influencers, another way of reaching the brand’s core consumers. It hits home for Sarah. She and her husband have been known to get away from it all by packing up their car and their kids, 7 and 8, for vacations in the great outdoors. For the family’s recent encampment, Sarah had just the ticket.